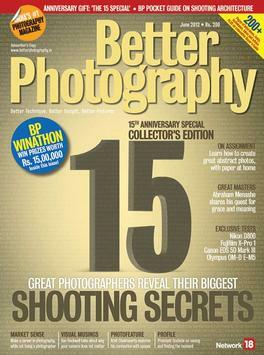 Better Photography is a photography magazine for enthusiasts and professionals. Its emphasis is on technique - whether cameras, digital or darkroom, showing readers by example how to capture better photographs. Each issue includes sections designed for novices (or refresher articles for everyone else), digital technique and darkroom dabblings. There are interviews with successful professional and enthusiast photographers, including examples of their work and in-depth notes on how the images were made. Better Photography also includes mini equipment reviews, a readers photos section and lots lots more!